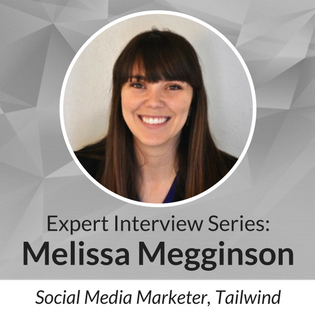 Melissa Megginson, Marketing Manager at Tailwind, is an award winning social media marketer who specializes in all things visual marketing. Can you talk about the mission behind Tailwind? How has the company evolved since it was founded? Tailwind’s mission is to make world class marketing easy for everyone. When our two co-founders first started Tailwind (PinLeague at the time), they were focused solely on Pinterest. While we still have incredibly deep ties to Pinterest, we have begun to expand our scope to helping marketers in every aspect of their marketing machine. What is your approach to digital marketing? What sets you apart from other marketing tools? One thing that I think really sets apart our approach to digital marketing is that we use our own tool in the marketing process. As someone who is marketing to marketers, I think it’s really important that I understand where they are coming from in their approach to using our tool. For example, I’ve been using Tailwind for Instagram for Tailwind’s Instagram account since about August. By being in the tool and figuring out our Instagram strategy in conjunction with the tool, I feel better positioned to market it to our target audience. By “eating our own dog food” we are better able to understand our customer’s needs and pain points. Why should organizations be focusing on visual marketing? What role should visuals play in an organization’s overall marketing strategy? Visual marketing is important because visual marketing is the way people consume information now. People are much more likely to check something out that has attractive images or a video than they are to look at a block of text. With the rise of visual platforms, like Instagram, Pinterest, SnapChat and even Facebook Live, it’s easy to see what visual marketing needs to be a part of any organization’s marketing strategy. Where do you see organizations struggling the most when it comes to visual marketing? What are the common challenges? One of the biggest struggles we see is a shortage of content, which is a struggle for me, too. This is especially true on a platform like Instagram. Thankfully there are free photo sites, like Unsplash, and free design tools, like Canva, that can help marketers develop content without having to be a pro iPhone photographer. A lot of our members get caught up in trying to “keep up with the Joneses”. They see peers posting 10 times a day to Instagram or see articles saying you need to be posting 100 Pins each day, then get overwhelmed and give up. But just because those people are posting a lot doesn’t necessarily mean they’re posting high-quality, engaging content. That’s why it’s so important to set realistic goals for yourself. It’s more important to produce high-quality content consistently than it is to overwhelm yourself with trying to keep up an unreasonable schedule. What are your essential tools for digital marketing today? What should organizations be incorporating into their digital marketing strategies? Of course, Tailwind is the tool I’m interacting with the most. But outside of that, I’ve found myself heavily relying on Open Broadcast System for our Facebook Live events. Each week we host a live event that includes shots of us in office as well as showing screencasts. Facebook Live has been an incredible tool for reaching our audience and OBS allows us to have a dynamic presence on the live event. What impact has cloud computing had on the visual marketing you do? I’ve become completely dependent on using the cloud to share all of our marketing assets with the team. No matter where I am, what device is being used, or when someone needs a file, I’m able to access those things from the cloud and share. I’ve only started really utilizing cloud computer within the past year, but it’s completely revolutionized how our marketing function shares information. How should organizations be using the cloud to manage their marketing? The cloud allows everyone to be on the same page, in real time. Gone are the days of files being passed back and forth with “Final-Final-For-Real-Final.png” appended to the file name. The cloud allows for teams to work together instantaneously, cuts down on time, and brings your files wherever you are. What should organizations be doing today to prepare their marketing strategies for the future? What do you see coming down the pike? I see high-quality visual marketing and live stream video continuing to be incredibly important to successful marketing strategies in the future. If you haven’t started implementing eye-catching imagery into your marketing or started testing Facebook Live, you will fall behind the pack soon. Stay up to date on IT trends.